No matter how hard I try to maintain a good sleep schedule, I often find myself lying awake, staring at the ceiling long after I should be asleep. My mind is either going over tomorrow’s plans, replaying today’s conversations over and over, or fixating on some other anxiety that I just can’t let go of. Exhaustion, stress, and anxiety take a serious toll on our bodies, causing headaches, tense muscles, and even weakening our immune systems. 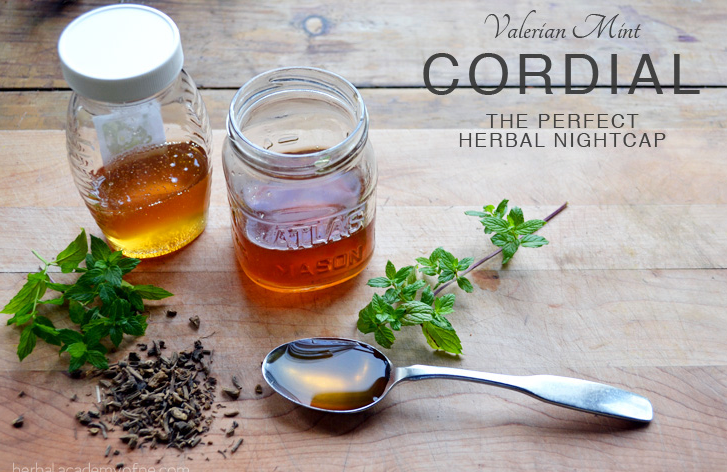 Getting a good night’s sleep is important, and valerian mint cordial is the perfect herbal nightcap to help summon the sandman. Want to learn more about Valerian? Here’s a great list to start with! You can buy valerian at most herb shops, or shop Starwest Botanicals online. Cats go bonkers over valerian like they do with catnip. It’s fun. Try it! What do you think about using elderberry syrup as a flavoring? You’d have more flavor than just honey, plus, immune support.